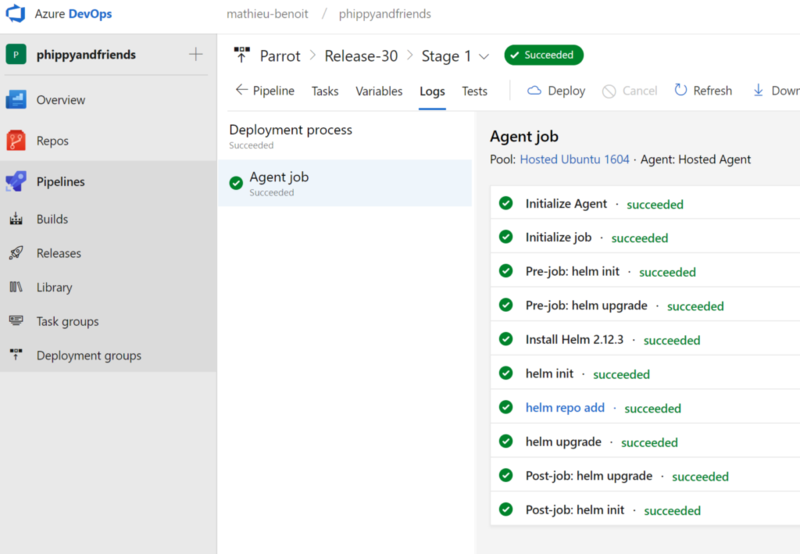 In this blog article, we will show you how to setup a CI/CD pipeline to deploy your apps on a Kubernetes cluster with Azure DevOps by leveraging a Linux agent, Docker and Helm. The combination of these technologies will illustrate how you can easily setup a CI/CD pipeline, leverage Configuration-as-Code and Infrastructure-as-Code, and accelerate your DevOps journey with containers. Azure DevOps helps to implement your CI/CD pipelines for any platform, any languages. Docker adds more consistency and quality for your apps, their deployment and management. Docker allows also to be programming languages agnostic, all your apps packaged as Docker images could be in different languages: .NET Core, Java, Node.js, Go, Python, etc. 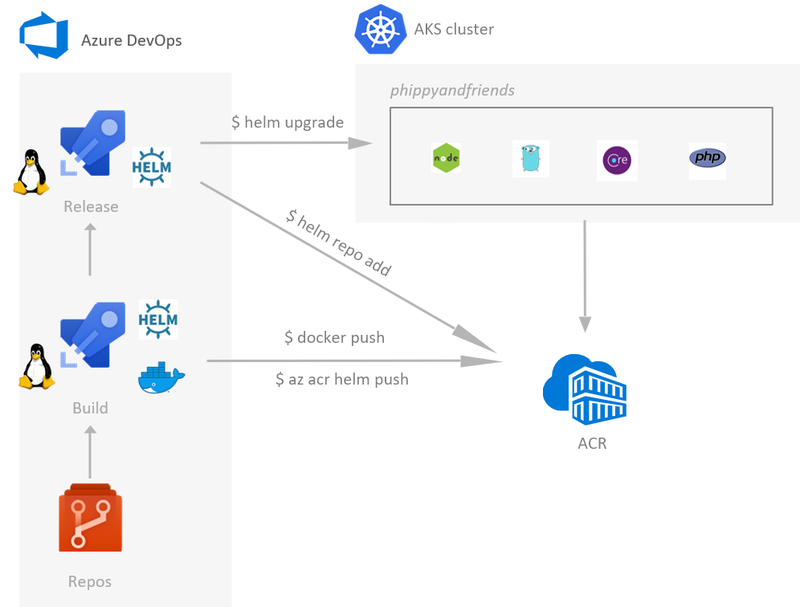 Helm simplifies and automates more your apps deployments in Kubernetes. Kubernetes is a container orchestrator that makes the collaboration between developers and IT pros easy and will for sure help you in the orchestration, management, and monitoring of all your apps containerized, in a consistent way. Azure Kubernetes Service (AKS) is a fully managed Kubernetes container orchestration service, simplifying the process around creating, scaling and upgrading your Kubernetes cluster. You are not paying for the master nodes, since that’s part of the managed offer. Azure Container Registry (ACR) is a dedicated enterprise container registry with advanced features like Helm chart repository, geo-replication of your registry across the globe, container build capabilities, security scanning for your images, etc. Azure DevOps account: we will use an Azure DevOps project for a Git repo and build/release pipelines. Create your free account and a new project here. Azure Subscription: needed to provision the Azure services for this demonstration. If you don’t have one, you can get a free trial one here. Bash Shell: we will leverage Azure Cloud Shell. Once your Azure Subscription is setup you can could enable and use your associated Azure Cloud Shell session. In this article, we will use Bash, which you can access here. You now have an ACR registry and AKS cluster ready to be used throughout this blog article. 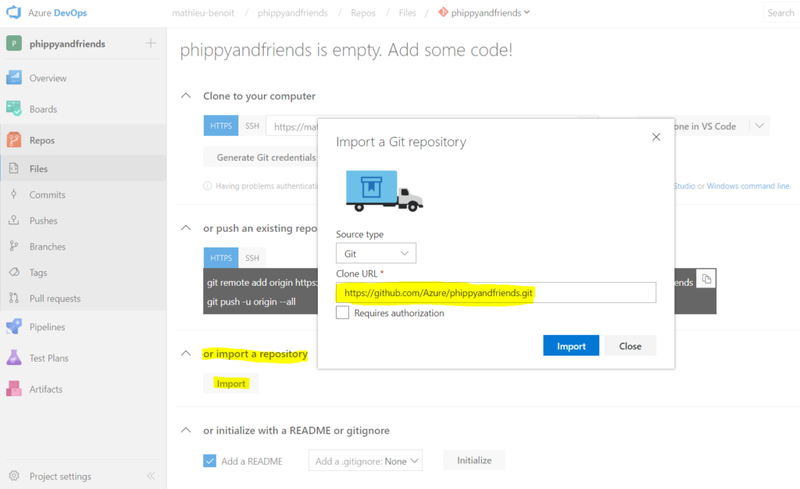 We will use the existing Azure/phippyandfriends GitHub repo. 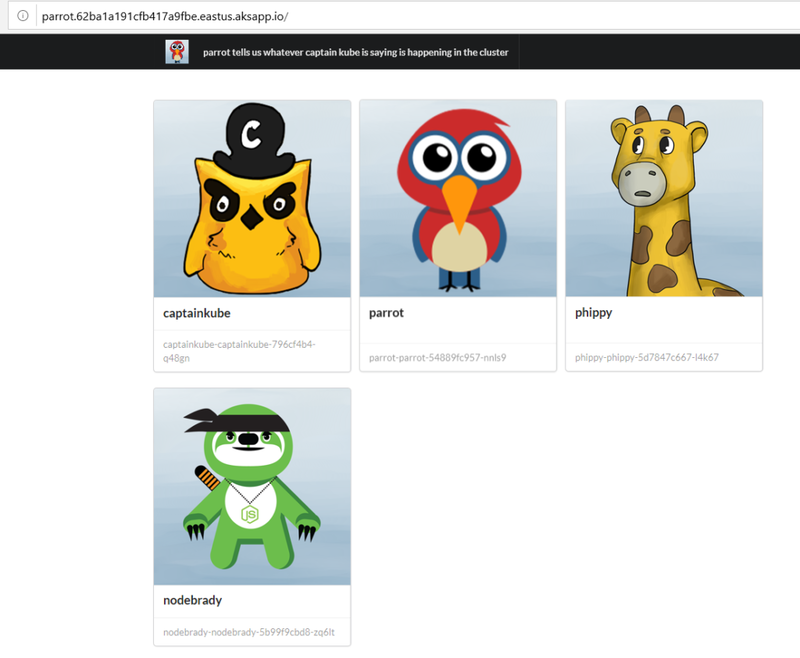 This repo has a few services, each of them represents an individual character of the Children’s Guide to Kubernetes and their new friend NodeBrady. Each service is written in a different language, showing how an AKS cluster can run anything you can bring it. Parrot is in .NET Core, CaptainKube is in Go, Phippy in PHP and NodeBrady in Node.js. 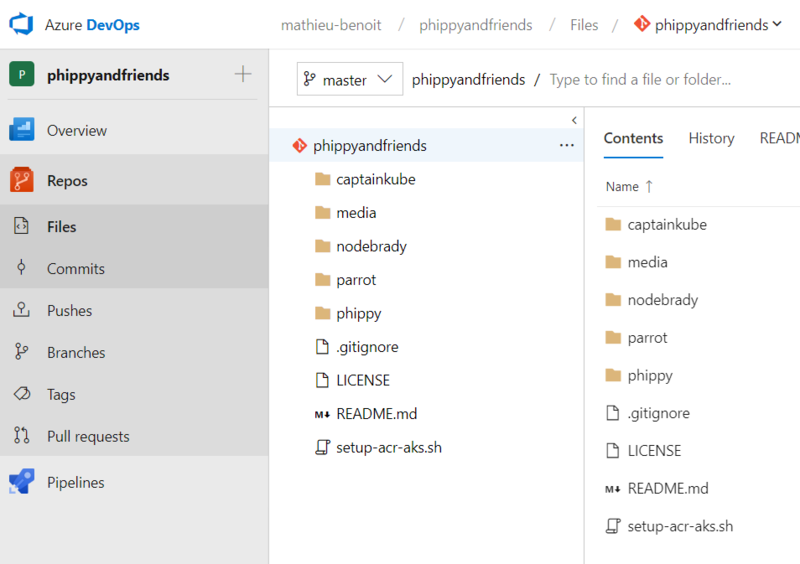 Files of the app itself, depending of the programming languages: Parrot is in .NET Core, CaptainKube is in Go, Phippy in PHP and NodeBrady in Node.js. Dockerfile file is a script leveraged by Docker, composed of various commands (instructions) and arguments listed successively to automatically perform actions on a base image in order to create a new Docker image by packaging the app. charts/* folder contains the files defining Helm Chart of the app. Helm Charts helps you define, install and upgrade your app in Kubernetes. With the next section we will also leverage the azure-build-pipeline.yml which plays an important role as Configuration-as-Code for the Azure build pipeline definition. You got this value in the Prerequisites & Setup section by setting up the service principal. You could now Save & Queue a new build which will push both the Docker image and the Helm chart in your ACR. Now both the Docker image and the Helm chart could be used for any Kubernetes cluster from anywhere: locally, etc. You will see in the next section how to use them with a release pipeline. You can now Save and Release > Create a Release to run this release pipeline, which will deploy the Parrot’s Helm chart. Congratulations! You have deployed the Parrot app on your Kubernetes cluster via a Helm Chart. With the next section you will see how to deploy the other apps/friends. 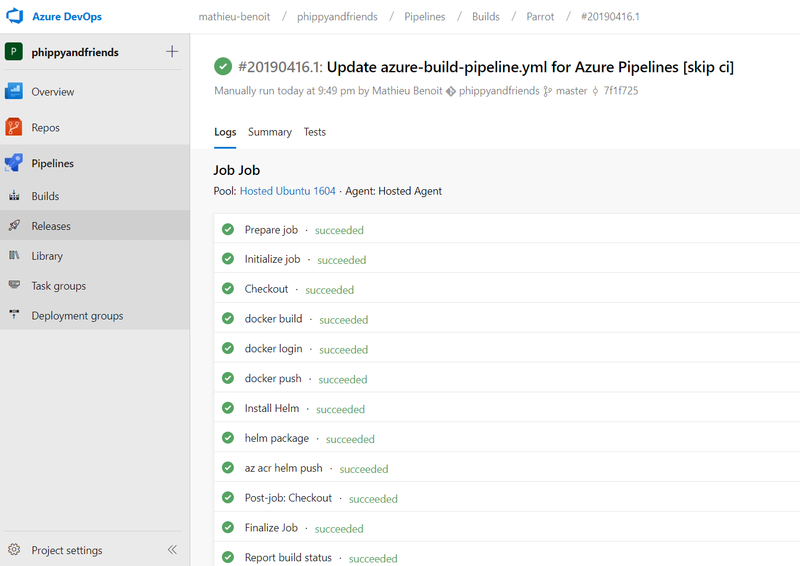 What’s Azure Pipelines release service? Where are Phippy and the other friends? You are right, we just have the Parrot app so far! You could now Clone both Parrot’s Build and Release pipelines definitions you created and adapt them with CaptainKube, Phippy and NodeBrody. Congratulations! You have deployed 4 different apps in a Kubernetes cluster by leveraging Azure DevOps, Azure Container Registry, Azure Kubernetes Service, Docker and Helm! You have also used Azure Cloud Shell to run some Azure and Kubernetes commands. 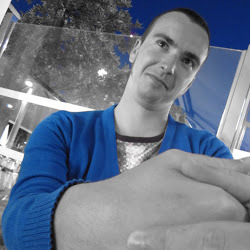 Note: Release pipeline as YAML file is coming soon. Hope you enjoyed this blog article and hopefully you will be able to leverage this for your own apps and needs. Questions or feedback? Let us know in the comments below. Cheers!